Editor’s note: This article is based on written comments submitted Wednesday (August 1) to the House Ways and Means Committee’s Subcommittee on Trade on behalf of the U.S. Dairy Export Council and the National Milk Producers Federation. After suffering three consecutive years of tight margins and a rural economy that never rebounded following the recession, U.S. dairy producers were hopeful that 2018 would bring a dose of much-needed recovery in milk prices. U.S. dairy exporters were looking forward to continued growth in global sales after the initial months of this year got off to a promising start. Our industry had made significant investments in recent years to facilitate sales in large foreign markets, and overseas customers were poised to increase purchases as the global economic outlook improved and demand strengthened for high-quality, high-protein U.S. products. Trade has been increasingly viewed as an indispensable element and overall a bright spot in an otherwise tumultuous time for the dairy industry: U.S. dairy exports grew to $5.5 billion by the end of 2017 and represent nearly 15 percent of domestic production. 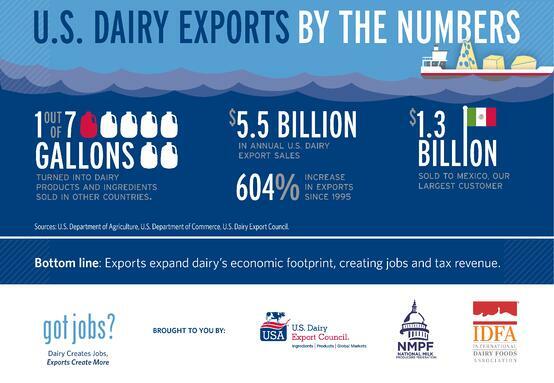 Since 2003, dairy exports have added more than $36 billion to the bottom line of producers. Exports support nearly 100,000 jobs and generate another $15 billion in economic input. Exports to Mexico and China, our two most important export markets, fueled much of the overseas success and were up 8 percent and 49 percent, respectively, since 2016. Our industry was cautiously optimistic at the beginning of the year as market analysts predicted a price uptick in 2018. That is what happened as we began the year. Unfortunately, since then we’ve seen a reversal in the nascent milk price recovery that was forming as mounting barriers to our exports developed. Prices have continued their downward trajectory, forcing even more farms out of business and applying economic pressure to dairy businesses of all sizes. The ripple effect of this is being felt from coast to coast since dairies operate in all 50 states, providing jobs for nearly 3 million Americans, as the video below shows. Retaliation by Mexico and China against U.S. imposed Section 232 and Section 301 tariffs, respectively, is a driving factor in the sustained economic pain. Since Mexico’s initial retaliatory tariff announcement on May 31, dairy futures prices sharply declined. It is important to note that dairy farmers are particularly vulnerable to such downward price swings because, unlike crop farmers who harvest once a season and can store and market product over time, dairy producers harvest and market their product daily. The price drop resulting from today’s tariffs is hurting dairy today—it is not a projection of what may happen this fall after crops are harvested. "Due to downward price movements in recent weeks, high stock levels, relatively weak growth in domestic use, and expected impacts of new tariffs imposed by China, dairy product prices for the remainder of 2018 are expected to be lower than forecast last month. For 2019, all price forecasts have been lowered except for butter." The U.S. government took an important step in providing assistance on July 24 when it announced a $12 billion tariff-relief package for America’s farmers and ranchers. The details of this package are still being finalized, including how much each sector impacted by retaliatory tariffs will receive to help mitigate the impact of those levies. That same day, NMPF issued a news release of support for the announcement of this package and noted that it will be important that the dairy industry receive an appropriate share of this aid, including: sufficient direct payments to farmers, investments in export assistance, and effective participation in government purchasing programs. NMPF has been in contact with USDA officials to pledge help and expertise in designing and administering a system that is reasonable and equitable to dairy farmers. In addition, we have also expressed our appreciation for the Agency’s hard work and our belief that this announcement should be viewed as short-term help instead of a long-term solution. No amount of assistance can replace the hard-fought markets that are being lost every day that retaliatory tariffs remain in place. Moreover, the longer tariffs persist the more difficult it will be to retain markets as our competitors work to seize the opportunity to expand their market share. A fair global market, where consumers and producers alike benefit from free-flowing trade is the ultimate objective, and a swift resolution to current trade disputes is essential to meeting that goal. The current situation unfolding in the Mexican dairy market is a prime example of the lasting damage that trade disputes can do left unchecked. Since ratification of the North American Free Trade Agreement (NAFTA), no country has been as welcoming to U.S. dairy products as Mexico. It is not a coincidence that total U.S. dairy exports have grown more than five-fold since NAFTA’s passage. In Mexico, we have worked collaboratively with our industry colleagues to grow dairy demand, build relationships between buyers and suppliers, and improve the infrastructure needed to efficiently move product to market. As a result, U.S. dairy sales there have grown from just $200 million in 2002 to more than $1.3 billion last year. As of last year, U.S. dairy sales accounted for more than three-quarters of Mexican imports. We are deeply concerned, however about the impact that Mexico’s 20 to 25 percent retaliatory tariffs on U.S. cheeses is having. America, which sold more than $400 million worth of cheese to Mexico, now risks losing sales to it biggest competitors in Europe. Mexico finalized a trade agreement with the European Union in late April that will increase Europe’s market access to Mexico and impose new restrictions on certain common-name cheese products from the United States. We ask for congressional support in accomplishing this important initiative. We similarly ask for assistance in China, where 25 percent tariffs took effect on July 6 against U.S. cheese, milk powder, whey and other common dairy products. Such tariffs put us at a steep disadvantage to competitors like the EU, Australia and New Zealand that are able to ship products at either the existing Most Favored Nation rate or in the case of the latter two countries under the terms of the FTAs each has with China. The Chinese dairy market is America’s biggest export destination outside of North America, totaling nearly $600 million in 2017 and showing explosive growth potential. Like Mexico, we’ve invested significantly in China to help facilitate trade. This includes a recent partnership with China’s Jiangnan University to enhance research and education and work with government officials to streamline registration approvals. U.S. dairy producers and businesses have worked hard to make advancements in China; we believe increased sales throughout Asia are key to our future success, and we are deeply worried that the current trade situation threatens to up-end the positive momentum not just this year but also in the years to come. Shawna Morris is vice president of trade policy at the U.S. Dairy Export Council.